If anyone was wondering whether the Drive-By Truckers was a band in decline, fear not. It’s true that their last album, A Blessing and a Curse was mediocre by Trucker standards. And it’s true that they lost guitarist/songwriter Jason Isbell. 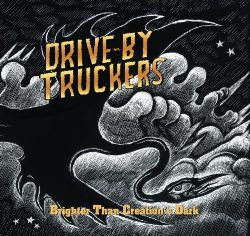 But their new album, Brighter Than Creation’s Dark, scheduled for release on Tuesday, Jan. 22, shows the Truckers at full-fighting strength. The DBTs are sounding more country than they have in years. Part of that is due to the recent return of John Neff, original Trucker and pedal-steel player. His dreamy playing on “The Opening Act” sounds as if he’s been listening to Jerry Garcia’s first solo album. It probably should have been apparent from last year’s “The Dirt Underneath” unplugged tour (which included a show at the Lensic) that the Truckers would be aiming for a more acoustic sound emphasizing melody. Perhaps there are too many slow ones here and not enough of the crazy rockers that the Truckers built their reputation on. But mellow doesn’t have to equal weak, as this album proves. Also contributing mightily to the sound of this album is Muscle Shoals deity Spooner Oldham, who is basically an honorary Trucker, having played a major role in the Dirt Underneath tour. Brighter Than Creation’s Dark shows the emergence of Shonna Tucker, the band’s bassist, as a singer and songwriter. Among the highlights here are “Goode’s Field Road,” a song by Trucker-in-chief Patterson Hood that displays the dark bluesy sensibilities heard on Bettye LaVette’s The Scene of the Crime, on which the DBTs served as the backup band. On “Checkout Time in Vegas,” a somber little tune with Neff’s steel playing off Oldham’s electric piano, Mike Cooley sings, “Bloody nose, empty pockets, a rented car, trunk full of guns.” It’s a loser’s lullaby in which you never quite find out what’s going on. You just know it’s a bad situation. Another cool Cooley song is “Lisa’s Birthday,” an outright honky-tonker that almost sounds like some long-lost Willie Nelson song. “Lisa’s had more birthdays than there are sad country songs,” he sings. The effect the Iraq war on those who fight it is the subject of two Hood songs. “The Home Front,” a slow, steady tune, is the story of a woman whose husband is killed in the war. Brighter Than Creation’s Dark is a long album. There are 19 songs totaling more than 70 minutes. In fact, my major problem with this work is its length. At this point, however, I’m not sure which tunes I’d eliminate. 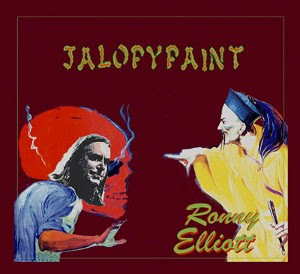 * Jalopypaint by Ronny Elliott. Here’s another ace album by one of the free world’s most unjustly overlooked songwriters. As usual, this Tampa, Florida, roots-rocker fills the disc with wonderful story songs dealing with his heroes, a few villains, and objects of his lust. There’s lots of history, a little politics, and plenty of brooding about his life and career. The album starts off with “Red Rumor Blues,” a meditation on the McCarthy era. The song ends with Elliott listing American icons who ended up on the blacklist — including some surprising names. Edward G. Robinson? Artie Shaw? Gypsy Rose Lee, for crying out loud? As always, Elliott’s back-up band (they used to be called “The Nationals,” but they’re not credited as that on this album) is tight and masterful. On “St. Petersburg Jail,” Alex Spoto’s fiddle and Elliott’s mandolin bounce off Harry Hayward’s martial drums. If you’ve never had the pleasure of hearing Ronny Elliott, this album is a good one to start with. But like the opium he sings about in “Brothels in China,” it is addictive. Groundhog Day Special: The Flood is returning! 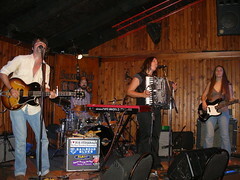 Hundred Year Flood and Goshen are playing at the Santa Fe Brewing Company on Feb. 2. It’s $10 at the door, but check HYF’s MySpace page for info on $5 tickets.